According to a report by Gallup on the State of The American Workplace, workplace engagement costs companies between $450 billion and $550 billion every year. These statistics indicate that companies know the importance of workplace engagement, however, only 30% of workers are engaged in the majority of workplaces nationwide. 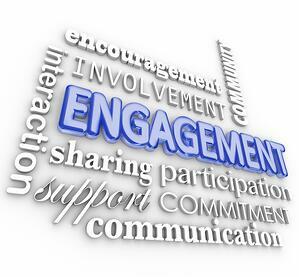 Workplace engagement is a critical component of making sure your organization doesn’t experience a high turnover rate. Having to constantly replace employees can severely affect the effectiveness of your hospital as well as increasing costs allocated to training and retention. Below are 5 of the top workplace engagement strategies to ensure your healthcare workforce is fully engaged and feels valued at all times. Your healthcare Intranet is a valuable tool to give your employees a voice and a mode of communicating their thoughts and ideas. One of the primary ways to ensure that employees are engaged is to make sure that they know that their thoughts and ideas are valued in the workplace. Positive affirmation can go a long way with your healthcare staff, especially with your clinical staff who often work long, odd hours. Make sure to allow employees to post to forums or to create blog posts so that they can relay ideas to other staff and management. Set up a separate kudos forum for staff to comment on good deeds accomplished by other staff members. Management can then respond in the forum or through comments on each blog post to promote interaction, communication, and increased, positive engagement. In addition to using the healthcare Intranet to voice employee ideas and concerns and to stimulate management responses, an Intranet can also be used to foster a sense of community. Healthcare employees are more engaged when they feel that they are an integral part of one centralized community. Sharing updates about your healthcare employees lives and sharing upcoming events and announcements via your Intranet is one of the most powerful engagement strategies you can employ. Making staff feel connected to the organization creates a more positive and engaged culture. Human beings are naturally sociable and like to feel as though they can relate to one another. Help your healthcare employees get to know each other by encouraging sociability in the workplace through the use of your company Intranet. Allow staff to chat online staff, create collaboration pages for projects, share recipes, or create a garage sale site or a classifieds section. Additionally, give your healthcare employees a special place to share personal stories where other staff members can like, comment, and share. Engagement is fueled by recognition and a sense of value. Healthcare employees want to feel as if they will grow and progress in their career If they feel that there is a chance of moving up in the workplace, they are more likely to be engaged. The Intranet can be used to encourage growth through mentoring and goal setting, and for posting new positions or sharing employee moves in the organization. Employees that view their workplace as a fun and engaging place are likely to be, well –engaged. If you take the time to organize fun activities that everyone will enjoy, then you can be certain that your employees will enjoy your company atmosphere. Countdown to these fun events using your Intranet social sharing tools for even more engagement in the workplace! HospitalPORTAL provides access to a fully featured Intranet and policy management solution. Read through our website for more information and contact us to schedule a demo by calling us at (866) 580-7700 today.